Synthetic peptide corresponding to internal sequence amino acids of Human Spectrin beta 5. Our Abpromise guarantee covers the use of ab167044 in the following tested applications. Expressed at very low levels in many tissues, with strongest expression in cerebellum, spinal cord, stomach, pituitary gland, liver, pancreas, salivary gland, kidney, bladder, and heart. Belongs to the spectrin family. Contains 2 CH (calponin-homology) domains. Cytoplasm > cytoskeleton. Detected prominently in the outer segments of photoreceptor rods and cones and in the basolateral membrane and cytosol of gastric epithelial cells. 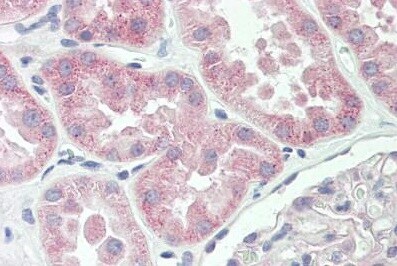 Immunohistochemical analysis of formalin-fixed, paraffin-embedded Human kidney tissue labeling Spectrin beta 5 with ab167044 at 5 µg/ml. ab167044 has not yet been referenced specifically in any publications. Publishing research using ab167044? Please let us know so that we can cite the reference in this datasheet. There are currently no Customer reviews or Questions for ab167044.